Taking advantage of their proximity to several cities, this enterprising dairy farming family built a day-care facility for children. They cater for pre-schoolers and up to 70 in after-school care, with demand high. Twenty eight people are employed. A husband and wife team previously struggling with commercial viability and organising family life on their dairy farm in a peri-urban locality close to several cities. They recognised a demand for child day-care facilities that could offer something special for kids - in a healthy, stimulating environment close to nature. So they went ahead with an application for modest funding support from EAFRD. The family's objectives were clearly defined. First, to find a practical solution to organising their own family life. Second, to diversify the income base of the farm. Third, to create employment in their area. And last but not least, to improve the link between the urban and rural environments by interesting children (and their parents) in farm life as a place to develop and grow. The main activities were to plan, finance, build and manage the establishment of day care facilities for up to 25 young children and up to 70 for after-school care. Professional advisory and development services were used to generate farm diversification ideas, and consultants were also contracted to assist with the application. 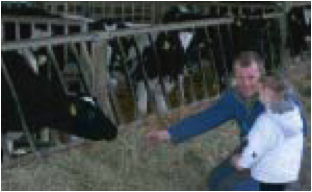 In addition to satisfying demand for child care facilities and creating 28 jobs (19 full time), the benefits from this project include: connecting the urban and rural environments; stimulating the interest of children in agriculture, nature and the environment; and diversifying the business and providing investment capital for the dairy enterprise. Municipality support, both strategic and financial, was strong although it took a long time to get a breakthrough for the necessary change in zoning for land use. The beneficiaries recommend seeking professional financial and business advice for anyone wanting to follow this model in other areas or countries. "Above all, make use of the space available in your rural area, be different, and offer something unique!"